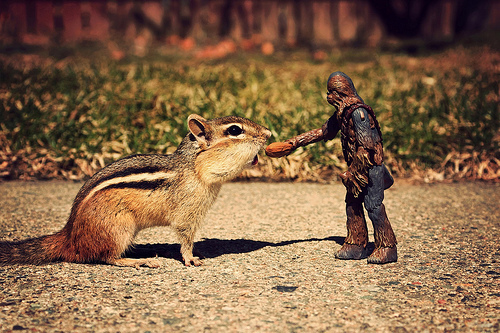 Photographer Chris McVeigh is back with more photos of his neighborhood chipmunk playing with Star Wars toys. This is not well-done Photoshop mashup. Chris places his action figures near a friendly, and very much alive, chipmunk who hangs out in his backyard. He convinced the chipmunk he named Billy, not by use of a simple Jedi mind trick, but with almonds! Chipmunks are curious little creatures. A number of the little guys live in my backyard, and I guess you could say that I've built friendships with them over the past couple of years. It's not that we share common interests, though -- it's that they can count on me to have almonds. It's easily their favorite snack. As a chipmunk learns to associate me with almonds, it begins to see me as a friend and not a threat. The bolder chipmunks will even jump into my hands or onto my lap! Once I have earned this level of trust, it's somewhat easy to coax them in front of the camera. Check out more of Chris McVeigh's creative photography here.